Key Practice: With longer periods under no-till management, soil organic matter may attain a new equilibrium level, and nitrogen (N) mineralization may increase. This can result in lower N requirements. in the crop early in the growing season. metres to the side and 7.5 centimetres below the seed row. 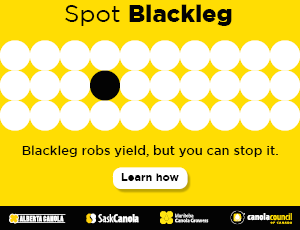 The key to higher canola yields is a soil with higher fertility or a greater ability to recycle nutrients. Long-term no-till can provide this. Agriculture and Agri-Food Canada (AAFC) research by Guy Lafond showed that canola yields were 16 percent higher for 22 to 31 years of no-till than 0 to 9 years of no-till. Wheat yields were 14 percent higher for long-term no-till. When no-till systems are initiated, surface soil organic matter (SOM) increases rapidly, increasing the N immobilization potential. During these first years, management is critical to minimize the potential for crop N deficiency. With longer periods under no-till management, the SOM may attain a new equilibrium level, and N mineralization may increase, resulting in lower N requirements. The length of time required under no-till to attain this level, or the “soil building” period, is not known, but it has important implications for efficient N fertility management in no-till systems. This three-year study did not see the same difference in yield for the two no-till durations as the Lafond study, suggesting that the equilibrium level may have been reached for these no-till fields. It’s possible that after 10 years of no-till management, soil quality in ST fields is approaching that found in LT fields. Residual nutrients and nutrient cycling are generally higher in LT than ST, as explained by the difference in flag leaf N response between the two fields. However it is likely that, later in the growing season, factors other than soil quality become more limiting to yield in both LT and ST fields equally. Given the yield benefits of no-till, the question remains whether growers can accelerate these benefits with higher N rates. In this study, the highest rate of applied N — 120 kg/ha (roughly 120 lb./ac.) — did not appear to be excessive for soil building purposes in either of the no-till histories. Further study is required to determine whether adding more N than is removed can improve soils more quickly without increasing environmental risks, and if soil-building using higher N rates is apparent in both long-term and short-term no-till soils. Residual NO3-N is higher with long-term no-till (green) than in short-term no-till (purple) after 10 years of varying applied N rates.